Sugar + Oysters: Easy as Pie? My mom gave me a rolling pin for a wedding present. The last time I made a pie crust? Never. I make my Grandma's pecan pie every year at Thanksgiving and Christmas. But sadly, I always buy the crust. I'm really more of a cake baker, but it's time for a change. With the ingredients below, at least I'll look the part. 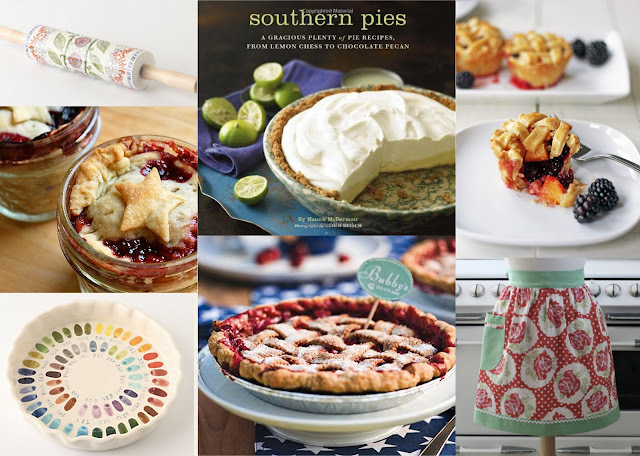 I think my favorite item is the bake by number pie dish... Or is it the sweet apron. Do you make your own pie crusts? Have you ever had pie in a mason jar? I love this blog !!! Go ahead and make a pie crust! You have inspired me to try again at succeeding with making one. The pie in the mason jar looks yummy! My mum taught me how to make the best pie crust.I am still not as good as her but I will keep trying!! I have a great pie crust recipe, but it isn't something you can screw up. It's basically crushed graham crackers and melted butter. Mmmm. You mix it up and then press it into a glass pie pan (tin? can you have a glass tin?) I guess it is pie plate. Anyway, then I believe you bake it for a few minutes. I haven't done it in a long time, but I used to make lemon pie fairly often, and beyond being time consuming, it isn't difficult. I also recommended using your rolling pin to roll out sugar cookies if you really want to play with dough. You just need a big enough cutting board and a lot of flour. Dough seems kinda scary, but can be lots of fun. Are you making a pie this weekend?